WASHINGTON — Researchers have developed and demonstrated the first handheld ophthalmology instrument with resolution-boosting adaptive optics technology that can image individual photoreceptors in the eye. The new portable instrument will allow improved diagnosis of eye diseases and could enable early detection of brain-related diseases and trauma. In Optica, The Optical Society's journal for high impact research, the researchers report their new light-weight instrument, which measures just 10 by 5 by 14 centimeters. They tested the device in children and adults, demonstrating its ability to capture images of even the very small photoreceptors close to the center of the retina that play a key role in vision. Photoreceptors, specialized neurons that convert light entering the eye into signals sent to the brain, are the only neurons in the body that can be imaged non-invasively. Imaging photoreceptors is not only important for diagnosing eye diseases but could also provide insights into processes occurring in the brain. Preliminary studies have shown that changes in the retina can be observed during the early stages of diseases such as Alzheimer's and after traumatic brain injuries such as concussions. "Until now, the imaging systems required for high resolution photoreceptor imaging consisted of large, heavy components on an optical table that could only be used with cooperative adults sitting upright," said research team leader Sina Farsiu from the Departments of Biomedical Engineering and Ophthalmology at Duke University, North Carolina, USA. "Our portable handheld system could expand this important imaging technique to children and infants, as well as to adults who may not be able to sit upright and stare straight ahead." The system could be used on people who are in a reclined position as they undergo surgery, for example, Farsiu's team reports. It could also help doctors rapidly assess possible brain trauma, such as in football players coming off the field with head injuries. "Because of the limited resolution of MRI — the standard method for imaging the brain in living people– MRI-based assessment of disease or trauma to the brain cannot be done at the level of individual cells," said Farsiu. "In the retina however, individual photoreceptors can be imaged at 100 times higher resolution than using brain imaging, allowing very subtle changes to be seen." To image photoreceptors today doctors commonly use a device known as an adaptive optics scanning laser ophthalmoscope (AOSLO). Although adaptive optics greatly improves the resolution compared to a standard scanning laser ophthalmoscope, the optical components required also increase the size, weight and cost of the overall system. Adaptive optics technology increases image quality by using an optical component called a wavefront sensor to detect light distortion caused by the eye. A deformable mirror that quickly changes shape is then used to compensate for the detected light distortion, leading to clearer images. To shrink the components within an AOSLO, the researchers developed a new algorithm to perform wavefront sensing. "Other researchers have shown that the wavefront sensor can be replaced by an algorithm, but these algorithms haven't been fast enough to be used in a hand-held device," said Farsiu. "The algorithm we developed is much faster than previously used techniques and just as accurate." The researchers also incorporated a commercially available MEMS-based deformable mirror measuring just 10.5 millimeters in diameter. "The optical and mechanical design combined with our new algorithm made it possible to create the handheld device," said Duke optics expert and team member Joseph Izatt. "Adaptive optics systems are very sensitive to slight vibrations or motions, but we designed our system to be very stable. The optics stay aligned when the system is transported, and it can also compensate for hand motions during use." 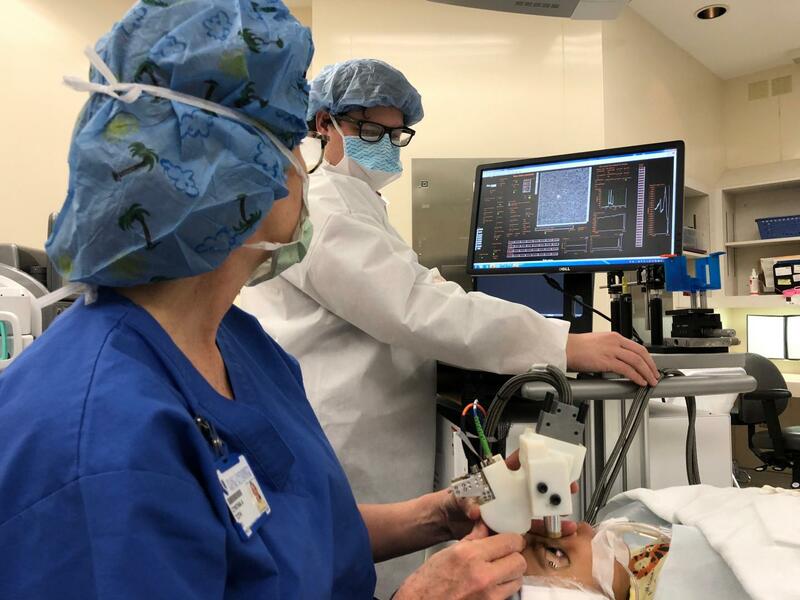 They used their new system, called HAOSLO for hand-held AOSLO, to image the retinas of 12 healthy adult volunteers and two children under anesthesia. The application of the system on a 31-month-old child represents the first use of adaptive optics to image photoreceptors in children. Photoreceptors in adult eyes gradually become smaller toward an area at the center of the retina known as the fovea. The HAOSLO system was able to image photoreceptors as close as 1.4 degrees eccentric to the fovea, where photoreceptors have an average spacing of only 4.5 microns. The closest that had been accomplished without adaptive optics was 3.9 degrees. Before starting large-scale clinical trials with the instrument, the researchers plan to incorporate additional imaging modalities useful for detecting disease. To help other scientists adapt their system for specific applications, the researchers made the optical and mechanical designs, computational algorithms and control software for the new HAOSLO system available online free of cost. Paper: T. DuBose, D. Nankivil, F. LaRocca, G. Waterman, K. Hagan, J. Polans, B. Keller, D. Travn-Viet, L. Vajzovic, A.N. Kuo, C. A. Toth, J. A. Izatt, S. Farsiu, "Handheld Adaptive Optics Scanning Laser Ophthalmoscope," Optica, volume 5, issue 9, pp.1027- 1036 (2018).